I am a little stuck. Yesterday I did a fab workshop with Jodi Ohl and began three canvases about a town I would love to have grown up in. Today I was to finish them, but I didn't. Now why is that??? I found myself doing just about everything else but. After considering this I realized that I do have a bit of a fear of collage! It seems I am comfortable with starting, but when it gets to all the touches that really make it pop, I freeze. Have you done this? Any of you out there have an area in art where you are unsure? And I do think I know what to do to fix it. I need to just Do It! I need to let go and just do it, regardless of how it might turn out, cause you see I want it to turn our "right". And I fear if I continue working on them, I will ruin them! Yet the only thing that will help here is me going ahead and working it out and finishing them. I know it is the experience of doing it and other collages (many) that will help me grow here. I know that the more I do the more I am going to find out what I like to do in a collage. What is my collage style?...I don't know yet! Am I brave enough to find out? Yes, I think I am. (I hear a little voice saying "but what if they turn out awful and you have to throw them away????!!!!!!"). The thought of that makes me cringe. I bet there are even more interesting things I could find out about myself if I delved more deeply.....sounds like a good thing to journal about. Well, thanks for listening about that. If any of you want to share about your art experiences I would love to hear. Tea Cup Tuesday tomorrow! I am so excited about this!!! 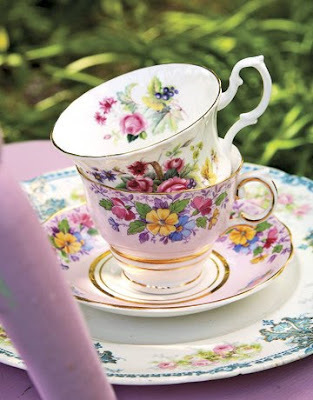 I did a search on Google for "Beautiful Tea Cups" and I found this lovely photo at a place called Tablescapes. I didn't want to use one of my own just yet...tomorrow I will. If anyone else wants to play with us tomorrow, just leave a comment and say you want to play. I will add your blogname to our list and that way others can come to your site to see your tea cups. It is a great way to meet new people! Turn off your inner critic and just collage. If you finish and you are not happy you can always add on to collage. That is what is so nice about a mixture of art. You will feel so much better if you don't have it hanging over your head. I say with confidence...LOL Looking forward to your tea cups tomorrow. I agree...just go for it...the worst thing is to NOT create anything for fear of creating something 'awful'...because it would be awful to simply not play and create!!!! remember, it's the process...the therapy, the fun that counts, and you just might end up surprising yourself! looking forward to TEA tomorrow! Count me in on the TEACUPS...let me know what to do. I have TONS of them in my cupboard. As to "collage". I used to suffer the same thing. Then it came to me. JUST CREATE. It's "art" and it's from you. If you don't like it, put it away and get it out sometime later to re-visit it. Try not to think of your creations as "what will I do with this". Just make it. I have a ROOM FULL of things I made. I don't sell them but the process makes me grow each time I make something. Collage is 'free'. There are no rules. Now go and play and ENJOY THE PROCESS, Terri. I'm behind you shoving you gently forward! I have the same fear to a point. I don't ever want to pitch it if I totally dislike it. Sometimes I add too much and sometimes I don't add enough if there is such a thing. Terri, I think we all have that fear! The main thing is to create for you, have some fun with it. I love making things for other artists, but in the end I am really creating for me. So go ahead and just play! I have a couple of your collage pieces and they are fabulous just like all your other creations. I hope you have my name down. I have my Tea Cup Tuesday posting up already as I am going to work tonight!I did email Martha. Thank you everyone! Your kind support is wonderful! Oh I know exactly how you feel Terri - you have spoken my thoughts! I know we should 'just play and don't worry' - but that doesn't come easily for me. Like you, I worry in case it all goes wrong.